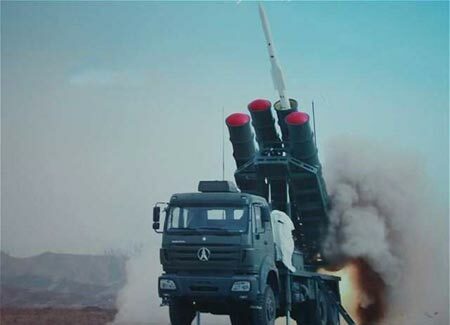 China North Industries Corporation based in Beijing has successfully exported its TL-50 or Sky Dragon 50 air defense missiles to Rwanda, according to Kanwa Defense Review, a Chinese-language military magazine based in Canada. Rwanda is the first and currently the only nation in Africa to use the TL-50. Designed based on China’s PL-12 air-to-air missile, the TL-50 can attack targets between 20 and 30 kilometers from the ground with an attacking range of 50 kilometers. Kanwa said it is now the most advanced air defense missile in East Africa, though Rwanda has purchased only a very limited number of the missiles. With the ability to track 144 targets, the TL-50 can launch 12 missiles to intercept 12 incoming targets simultaneously. A photo of the system was shown at the Africa Aerospace Defense Exhibition this year which shows a single missile launcher with four launch tubes. Rwanda must have at least four TL-50 launchers as this is the system’s lowest operational unit, Kanwa said. The missile also has fire and forget capability, Kanwa said. However, the TL-50 has not entered service in China, as the PLA has selected the HQ-16 as its current standard air defense missile. Previous Rwanda vs BBC: Kagame yiyambaje umudepite w’ igisahiranda kugira ngo BBC ibe yanengwa.